Are they not completely bizarre and wonderful?! Hee. Did you find my readers? I can't find that pair anywhere! Are you actually admitting that you need reading glasses? 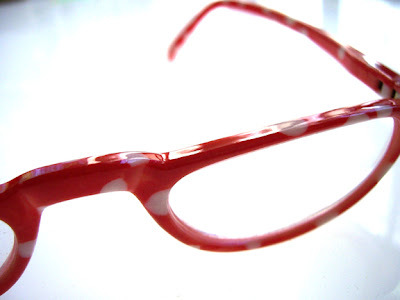 It would be worth having crummy eyesight just to wear those. Hey, I want some like that! Mine look like granny glasses. Those are awesome--way better than Sally Jessy Rapheal's! Love the Eye Candy! And Harlot already has a great big wonderful pic of you on her blog!! You look so happy & cute. Saw you on Yarn Harlot's blog! Woo Hoo!! Romi, I just saw a picture of you on the Harlot's blog! You're holding the famous sock. Lucky you getting to see Stephanie in person. You look great...and wow, lovely shawl!